I don’t think that it is very often that you have to drag yourself out of a shelter in the morning because it is too hot, especially whilst located at 830 metres in April. After another sub-zero night that is exactly what I had to do. OK so I had lazed around in my sleeping bag until gone 9.00am and the sun was getting high in the sky. You have to relax and take things easy when exploring wild areas on your own. So I dragged out a groundsheet to sit on whilst I drank coffee and ate noodles. The air was particularly cool and fresh without the Trailstar to keep it at bay. I have to say that I felt rather smug and pleased with myself as I made another coffee and had a lie-down on a blanket of soft springy moss. 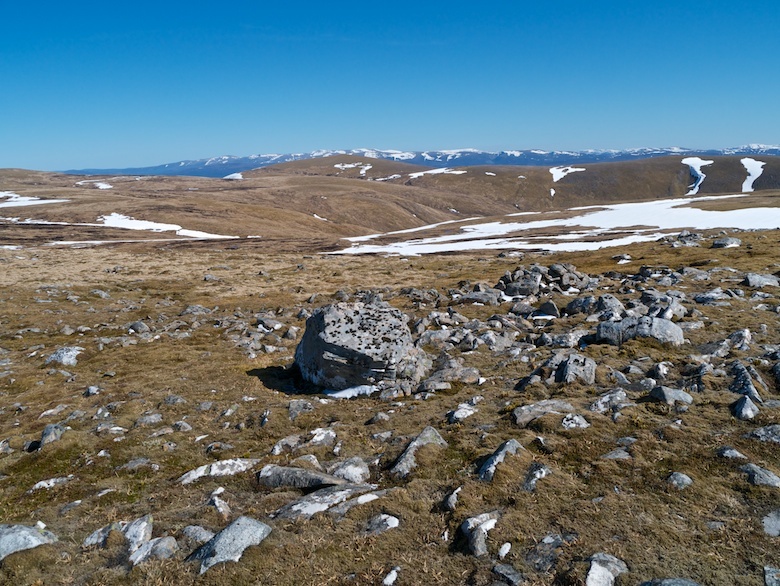 It did not take long to pack and I was soon on my way up the Northern flanks of Geal Charn. This gave a great view of the way I had walked the day before, across big empty hills. 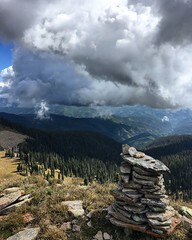 With a high starting point I was at the summit cairn in no time at all. Even with a late start I had it all to myself. On such a clear day the views were superb. When conditions are like this you realise just how small Scotland is. I got the impression that I could see a fair chunk of it. The western hills on the other side of the Great Glen looked large, clear and snowy. The bulk of Ben Nevis looked close enough to touch, whilst the Cairngorms loomed close by. However my eye kept on being drawn to the high brown plateau nearest to me. 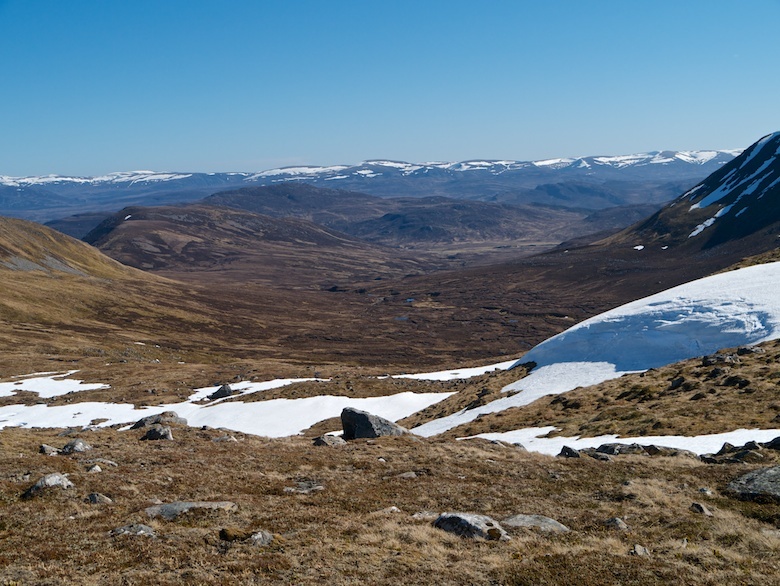 This was the hidden heart of the Monadhliath, which after a snack I set off to explore. 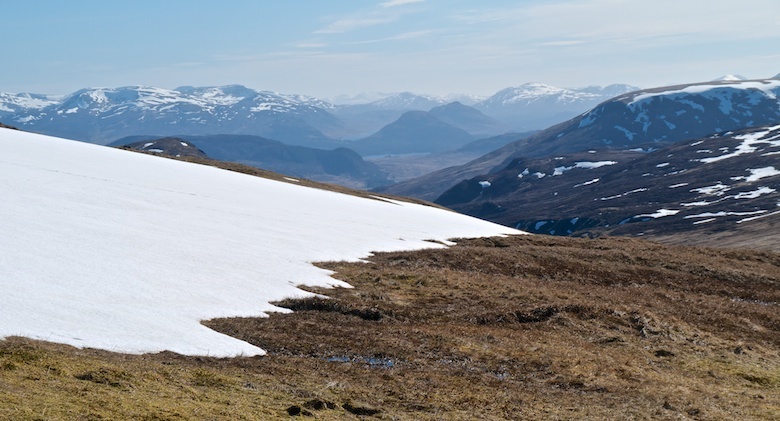 A line of fence posts led across easy ground towards Loch na Lairige, snow patches still firm after a frosty night. 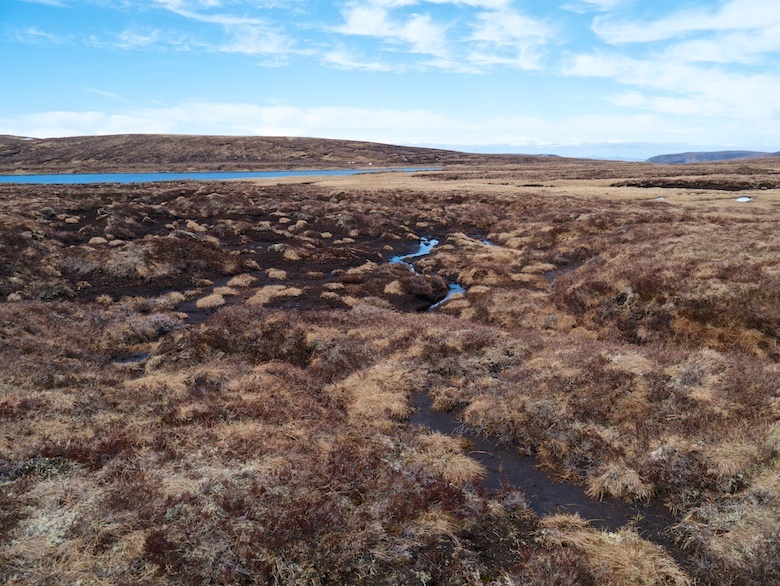 The area around the Loch itself was a maze of peat hags, groughs and hidden gurgling streams under the turf. It took a while to navigate but still much tamer than my local stomping ground of Kinder Scout and Bleaklow. I was still cautious not to disappear up to my waist in a bog however as help was a long way away. The going got easier once I reached the outflow of the loch and followed it downstream. 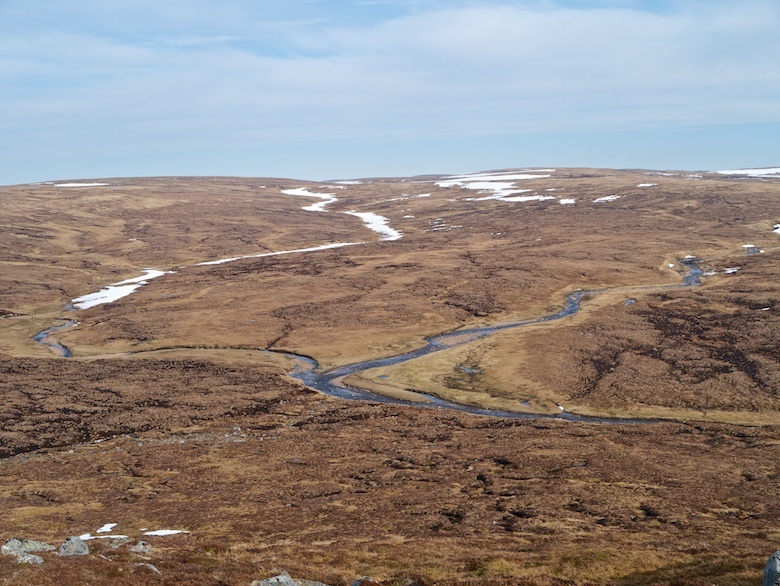 One of the secrets of the Monadhliath are its watercourses. 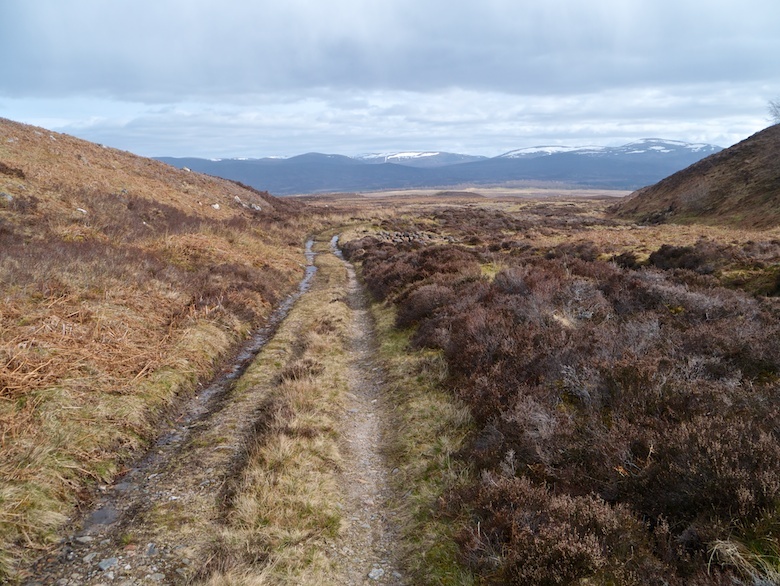 These are usually (but not always) pleasant grassy linear routes through the heather and bog. A way to make easy progress and find good places to camp. This one was no different with easy banks to follow. 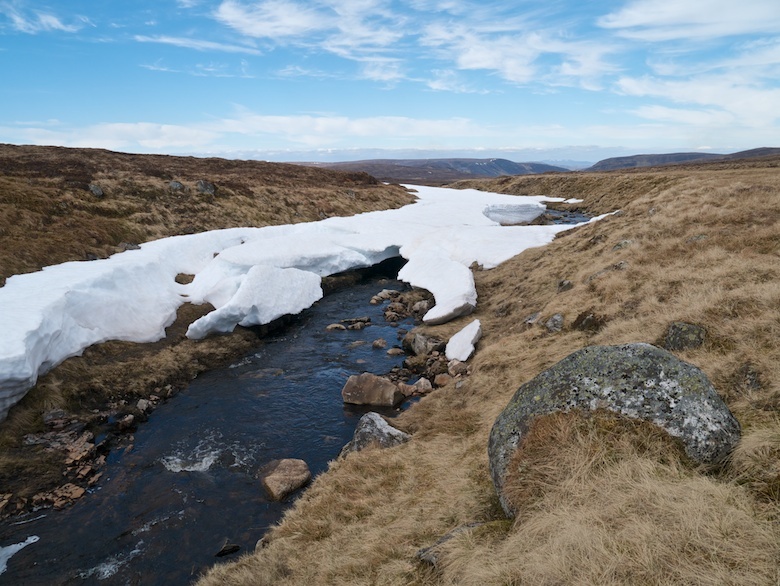 Large patches of snow were still covering the stream at some points, fragile snow bridges waiting to catch the unwary. The feeling of wildness was lost when I reached the Chalybeate Spring, the start of a vehicle track. It was not visible down by the stream so I sat for a while and had lunch in the warm sunshine. The track is part of the Hydro scheme, a new addition to the landscape. I followed it south before taking a branch that contoured high along the hillside visiting several concrete weirs. To be fair to the developers they have at least made an effort with regards to landscaping, I have seen much worse in the hills. Vegetation is already claiming the surrounding scars. I would still prefer it not to be there though and there may be much worse to come for this wild and lonely area. The tall narrow spires of the wind monitoring masts stood like watchful invaders ready to claim their prize. The hard surface of the track was not kind on my feet in the heat as I followed it to its terminus at the Allt Cam Ban. I crossed a well hidden footbridge below the weir and took to boggy ground as I followed the stream upwards. 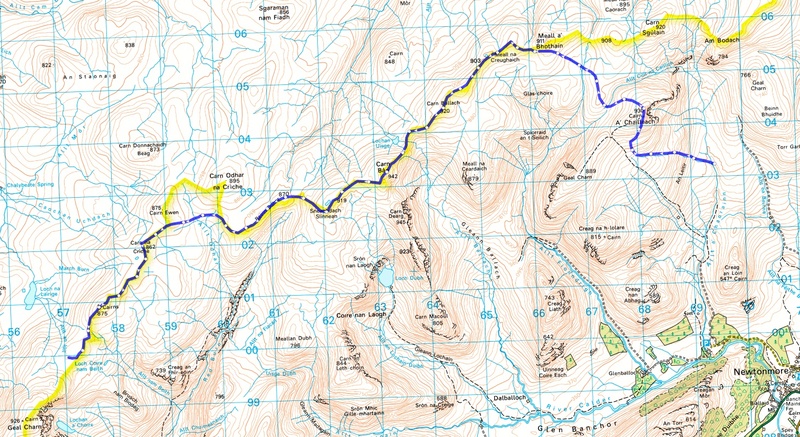 My intention had been to continue along the north bank but I changed my mind and climbed to the 801 metre summit which is unnamed on the 1:50k map. 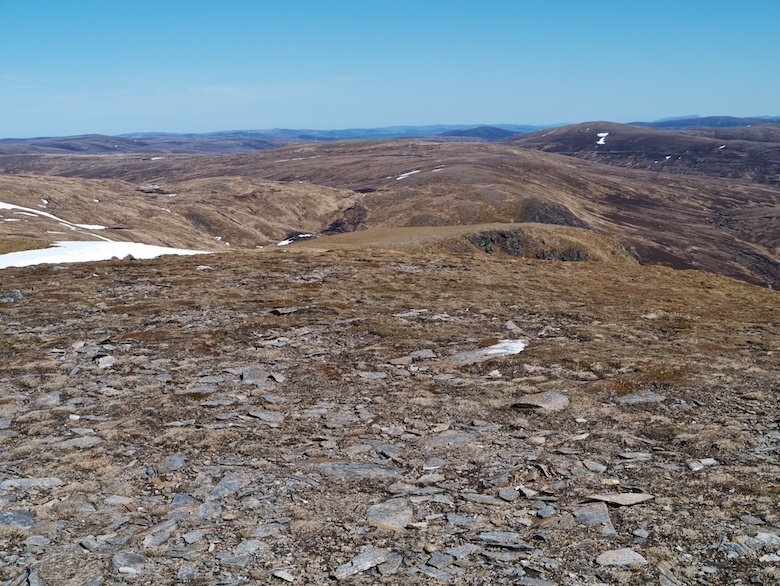 Here I sat by the cairn and removed my boots and socks to let my feet steam. I was totally lost in my thoughts when there was suddenly a smiling figure coming towards me. It totally startled me to be honest as it was the last place I expected to see anyone. The thought was mutual as the chap who came and joined me really did not expect to see anyone on a unremarkable hill in such a remote area. A pleasant half hour was spent chatting with a fellow backpacker and lover of lonely places. He was spending a few days in the Monadhliath ticking off all the SIMS. I can’t remember the criteria but there are about 15 million such hills in Scotland. He had done most of them. 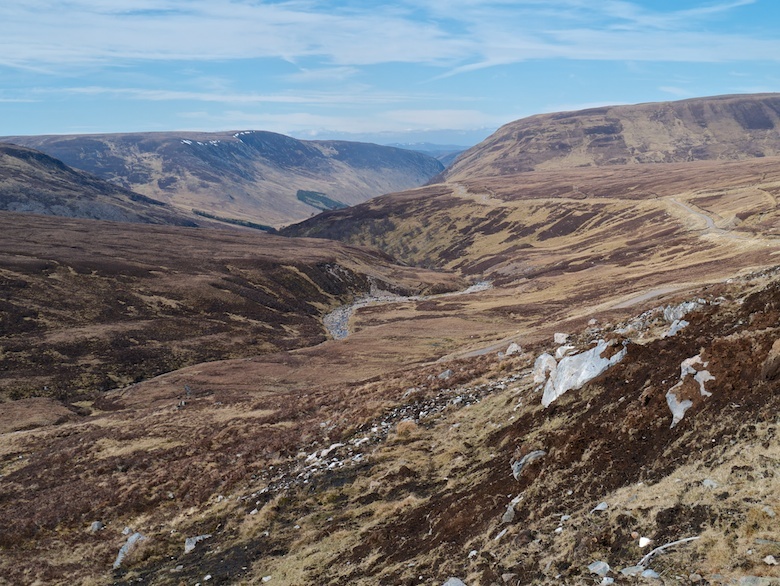 As we parted ways he headed towards Burrach Mor at a cracking pace whilst I descended into a high level bowl where the Allt Cam Ban meets the Allt Cam nan Croc. 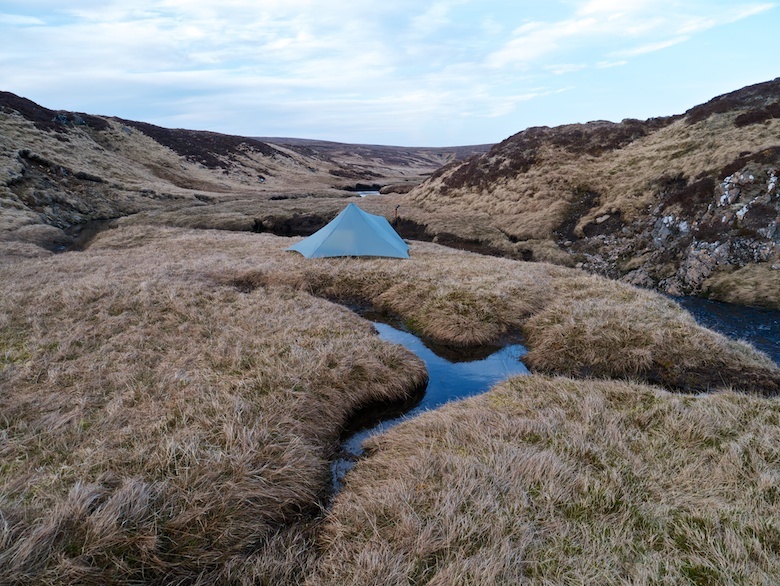 My earlier companion had already pitched for the night next to the river, I could just about make out his tent below. A splendidly wild and remote spot. I dropped down close to where he was pitched and followed the stream for a bit. 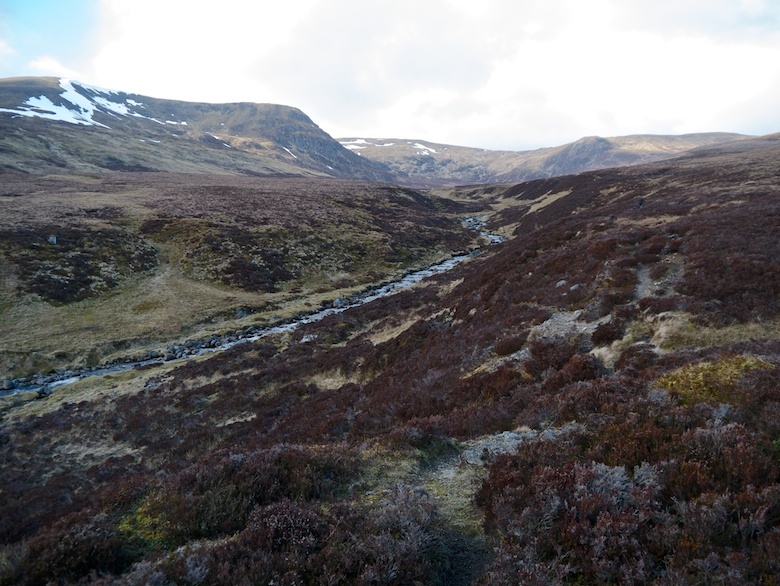 A green strip led easily though rough ground over the shoulder of Burrach Mor into the rocky headwaters of Coire an t-Sreatha. The going then became tough and unpleasant for a while, the late hour and a spot of fatigue not helping matters. I was relieved to see the roof of the Eskin bothy below me, hopeful that the place would be fit for habitation. Upon closer inspection is was a ruin, fit only for the desperate to spend a night inside. At best it is a handy brew spot for when the weather is bad. The bothy sat at the top of one of the largest cornices that I have ever seen, a huge crevasse showing that gravity would soon release it. I took a circuitous route down to the valley floor, marvelling at a twenty-foot high snow bank dripping away like a dying glacier. From up above the ground looked like it would be perfect for pitching. However on closer inspection the close-cropped grass was wet and spongy, the snow only recently melted. It took a while to find a relatively dry spot. I quickly got the Trailstar up as I was extremely hungry and felt the need for a long lie-down. Although I was pitched on a valley bottom I was still located at 650 metres, my lowest altitude for many miles. * 20lb sounds better than 9kg. It got to the point over the winter when I was struggling to get up those hills. My lungs were bursting and my knees complaining. I just had to reduce the amount that I was carrying when backpacking. 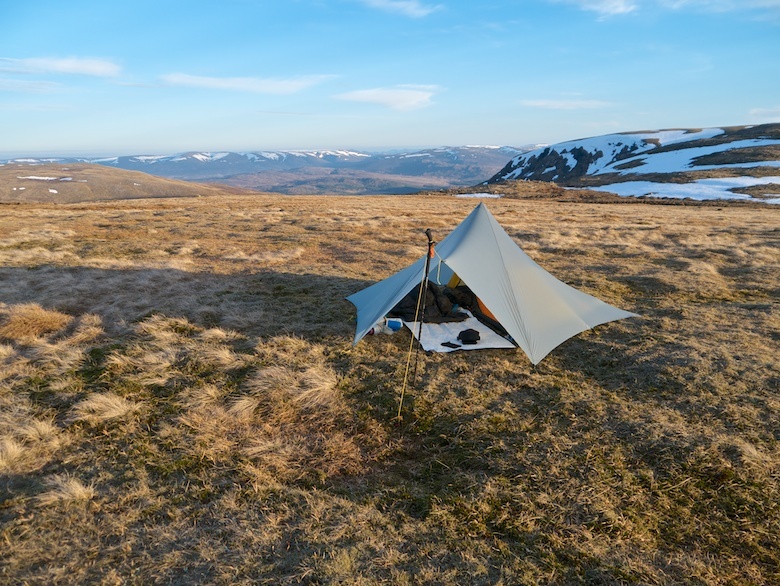 The traditional route is to shave 12 grammes off your stove by spending £50 more, replacing a good shelter for one made out of Cuben fiber for £300 extra, or ordering a rucksack that is as comfortable as a Bargain Booze carrier bag. Instead I went down the route of reducing the amount of food I was stuffing in my fat face. Now four months later when I head out of the door on a backpacking trip my total all in weight has been reduced by 20lb. I can get up the hills a bit quicker and my knees are only moderately unhappy rather than screaming at me to stop. With this reduced weight my pack has remained the same, yet I have noticed the difference. 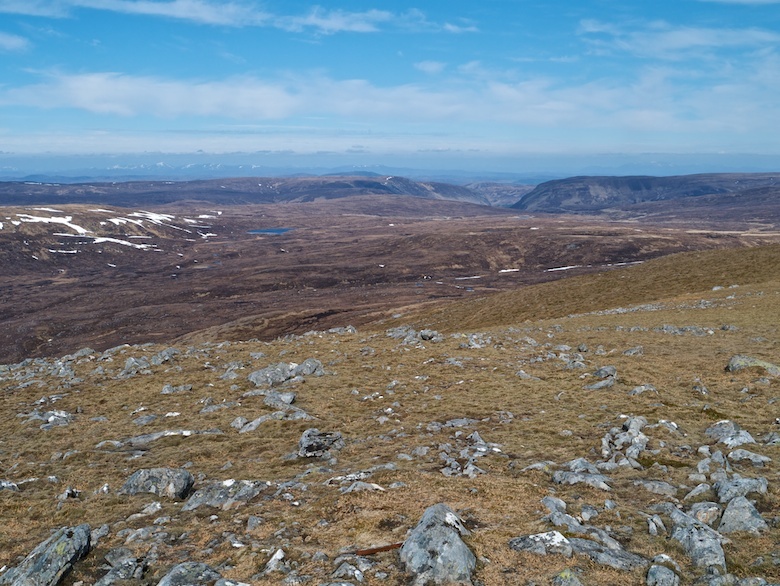 On a couple of occasions on the recent Monadhliath backpack I almost felt sprightly (this could have been sunstroke though). With the TGO Challenge looming I have noticed all the gear spreadsheets appearing on the blogosphere. Each one is trying to out do the next by having the lightest pack weight. Did you know that by only carrying one pair of socks instead of two you can save yourself a whole 80 grammes**? This is absolutely fine by the way. The only problem is that a majority of the gramme weenies are middle-aged blokes with an expanding waistline*** (to be completely balanced and so not to be seen as a bit of a weight fascist I am also a male on the wrong side of 40 with an expanding waistline). I therefore want to introduce a new rule. If you spend time putting together a gear spreadsheet then you must at the bottom put down your BMPI. This is your Body Mass Pack Index. This is worked out in the same way as BMI but you stand on the scales wearing your pack. Let the competition begin………..
** sorry I am only guessing at the weight here as I have never weighed my socks. *** you can’t beat an unproven generalisation. 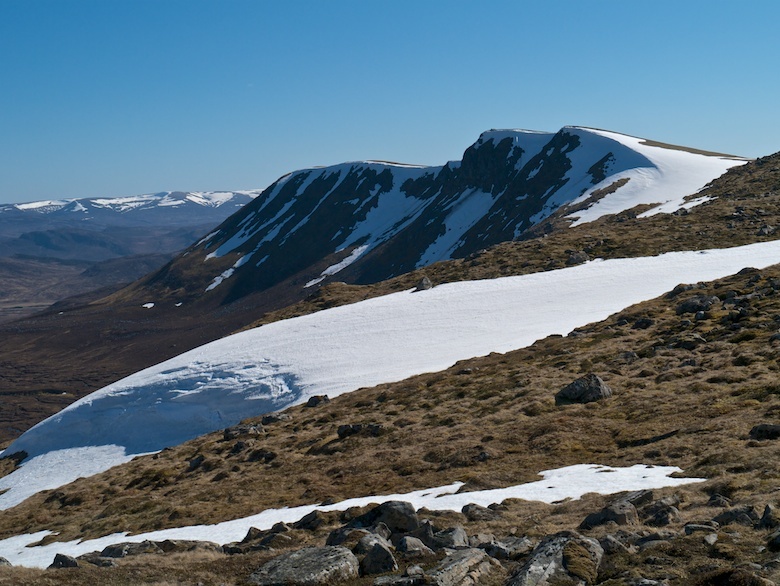 The Monadhliath Mountains occupy a huge tract of the Scottish Highlands. This is not an area of soaring ridges and fearsome pinnacles. 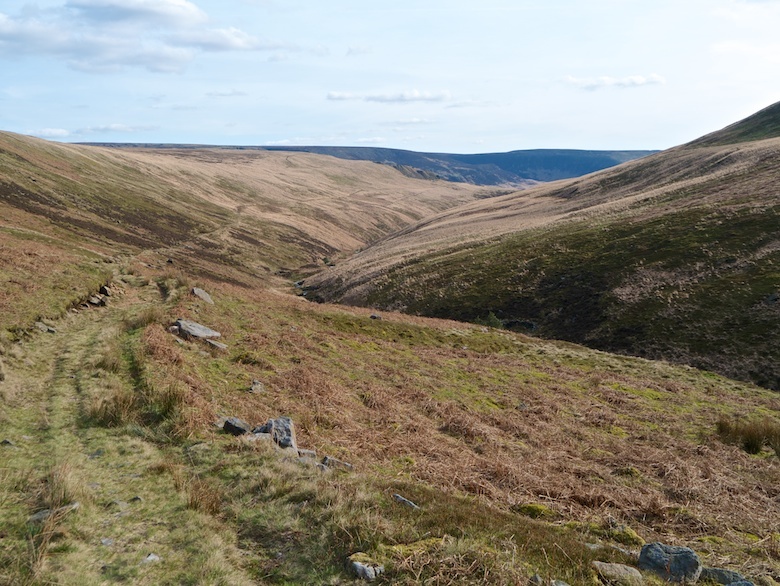 It is a much more understated landscape, one of vast open moorland and hidden river valleys. A place where you can walk for days and not see a soul, where eagles sour in big sky country. 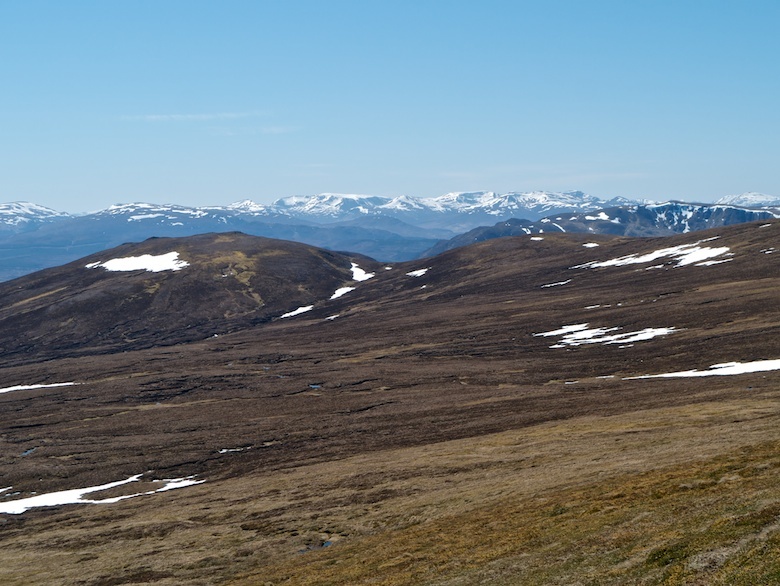 Apart from the Munros close to Newtonmore it does not hold much appeal to the casual day walker. Instead it is a place which needs to be explored over several consecutive days, nights spent sleeping out far from civilisation. A chance to move slowly through a landscape that makes you feel small and insignificant. A place where the journey is more important that any particular destination. The large area and the fact that there is no one single location that demands a visit made planning a backpack rather difficult. Places on the map do no instantly leap out at you. I left home with three rough routes in mind, I would make a last-minute decision as I left the car. As it turned out I did none of them. With fantastic weather I ended up making up a route as I went along, exploring places on a whim. My slackpacking tendencies were forgotten. I had no idea how far I had walked each day or what I would be doing the next. Arriving home it turned out that I walked eighty glorious kilometres that Easter weekend. I had a smile on my face for every single one of them. 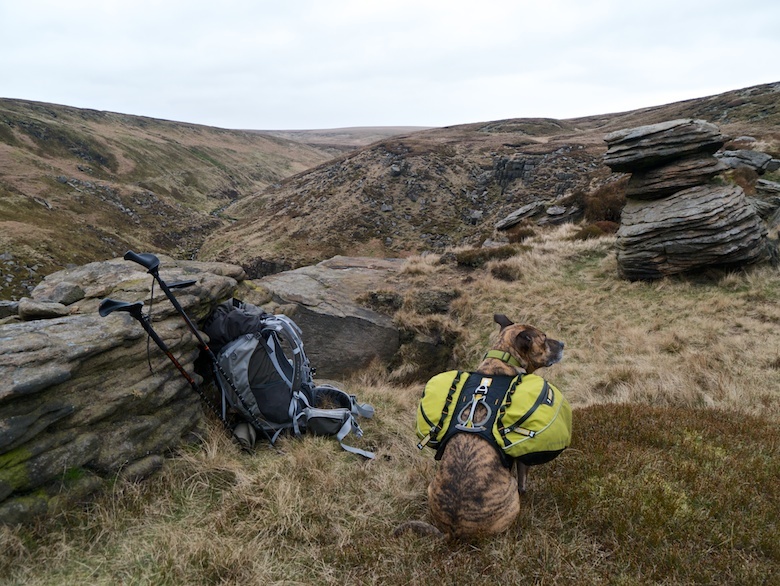 I was knackered before I even put on my rucksack, the long drive being rather tiring. During planning I had the inspired idea of parking at Kingussie and getting a taxi to Laggan (there is no public transport between the two). However when I got to Kingussie there was no answer from the taxi company, I suppose I should have booked in advance. Instead I shouldered my pack and headed towards Loch Gynack under threatening skies. The walk along the tarmac parallel to the golf course was a bit of a plod. 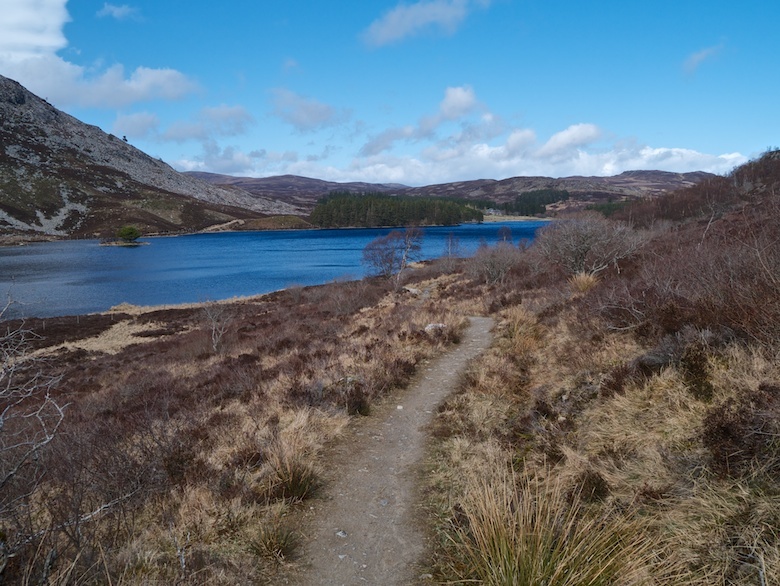 A climb through woods and I was on the southern shores of Loch Gynack. This is on the route of the well signed East Highland Way meaning that I could disengage my brain for a while and enjoy the surroundings. At the edge of a forest plantation the long distance path was left as it took a dogleg to Newtonmore. 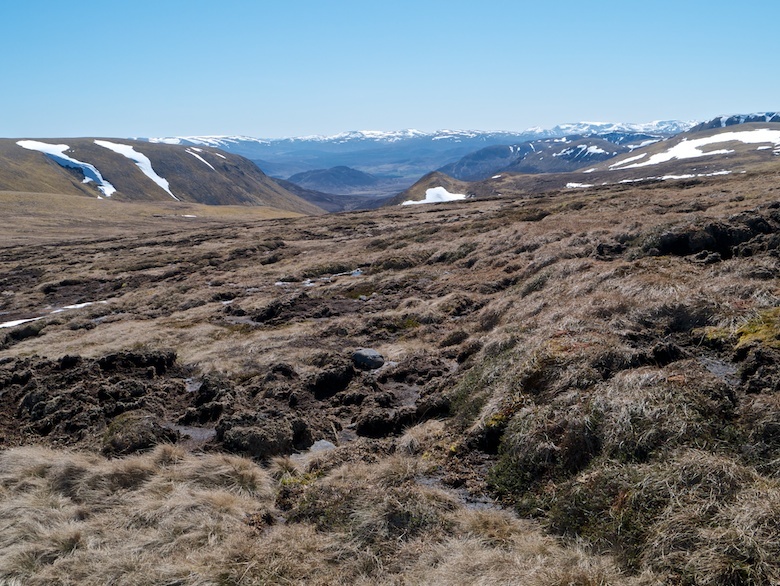 I continued on a cross-country yomp to connect to the track leading up Allt na Beinne. Here I was hit by a series of vicious squalls; hail, rain and snow blown down the glen in great sheets. When they came through I had to turn my back and wait a few minutes until they had passed. A face full of weather is never much fun. 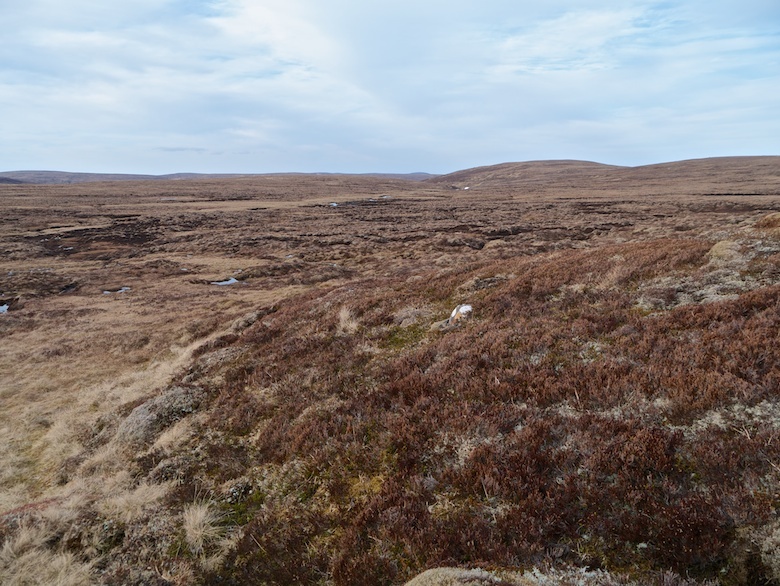 The security of a track was once again left to follow a side stream across rough ground until the Allt a’ Chaorainn was reached. Here the full force of the wind buffeted me as I set a course above the lively river. I dropped down to a grassy patch next to the river hoping that I would get shelter from the wind. It was not much better to be honest but it was forecast to drop during the night to give a calm and frosty dawn. I find the Trailstar a bit of a faff to erect in the wind but I had soon wrestled it into shape. It was the evening of my birthday and I was billy no mates. 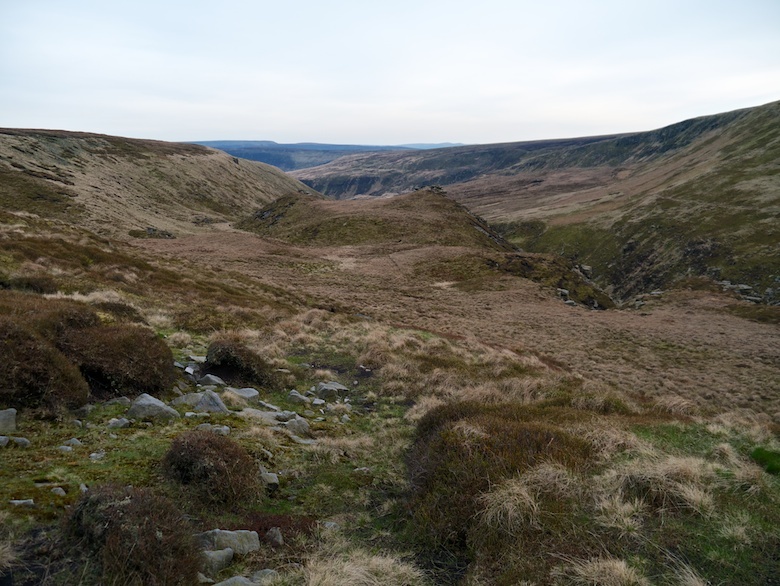 For some reason my wife did not find the thought of spending the Easter Weekend exploring remote moorland very appealing. With five days off work I felt the need to put them to good use. The glorious weather that followed meant that I was glad that I had. Although a short day mileage wise I was knackered. I did not even need to switch on my torch as I was asleep by 9.00pm. The wind did indeed drop during the night and so did the temperature. I woke sometime before dawn and glanced at my watch by my head, it registered -2 C in the inner tent. My platypus was fill of ice when I took a sip from it. I shivered and burrowed further into my sleeping bag. Although fully awake I decided that I would not move until the warmth of the sun had hit the Trailstar. Being next to a high bank that did not happen until 9.00am by which time I was fast asleep again. One of the pleasures of backpacking alone is that you can set your own schedule. With the days getting longer I felt no urge to get up and begin walking at the crack of dawn. 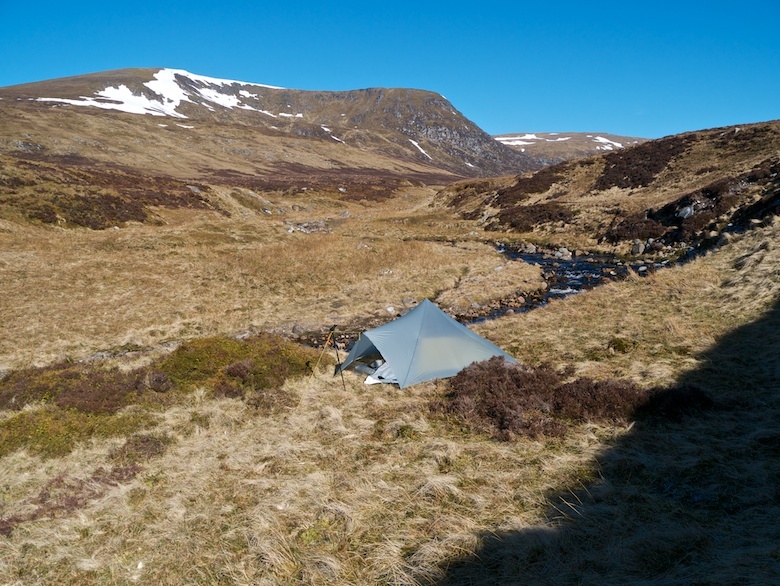 I enjoyed bumbling around camp, both the location and weather were spectacular. I did not think that it was possible for the sky to be so blue. It was tempting to stay there for hours and laze about but I was determined to make the most of the weather. It was gone 11am by the time I had packed and found a point to cross the river. 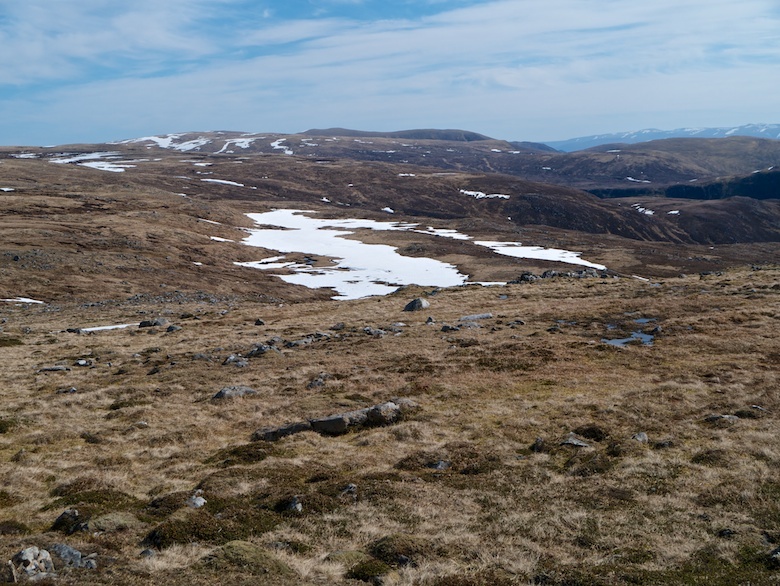 As I ascended the Munro of A’ Chailleach I could make out tiny figures on the main path above. I took a pathless route alongside a small side stream, the heather becoming shorter and crisper with height. 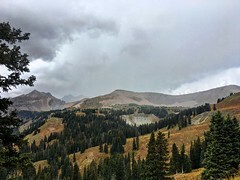 I stopped often to take in the views. As well as the skies being free from clouds the visibility was near perfect, the horizon being filled with snowy peaks. There were so many that it was hard to get my bearings and identify them. 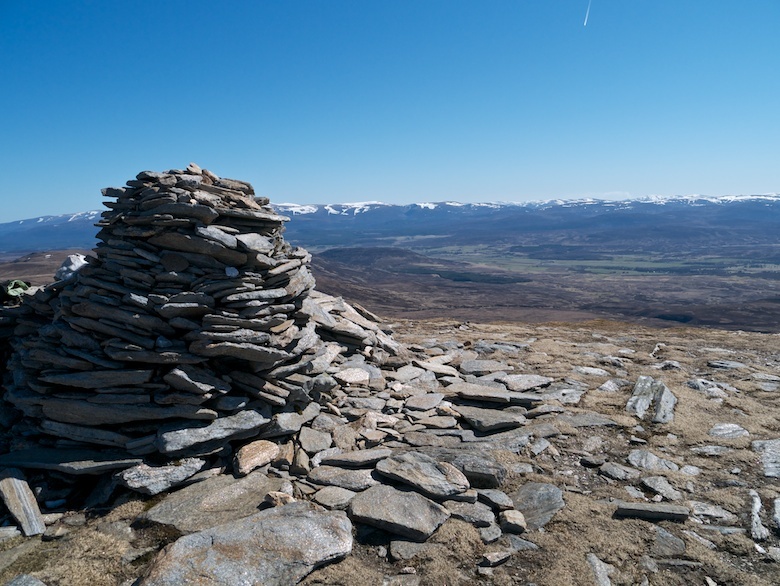 The main path was picked up on the final rise to the summit, which was marked with a large cairn. 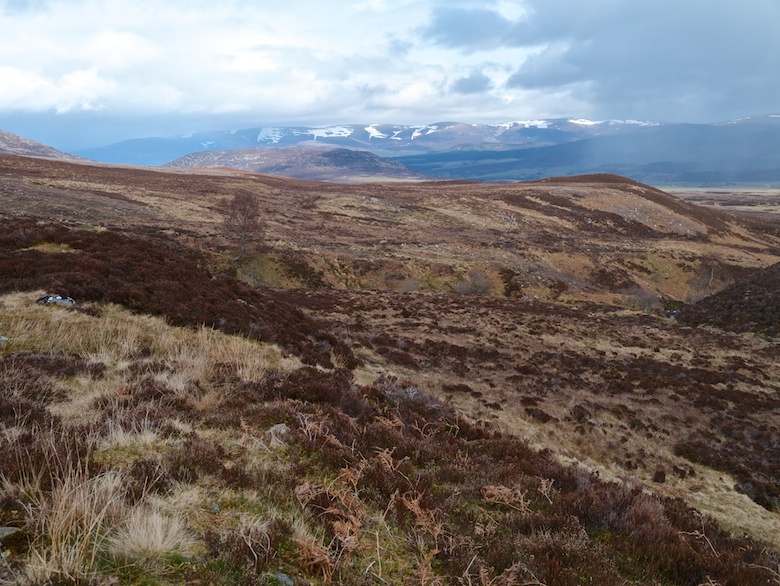 The Cairngorms across the Spey Valley looked spectacular, however my attention was drawn to the north and west. 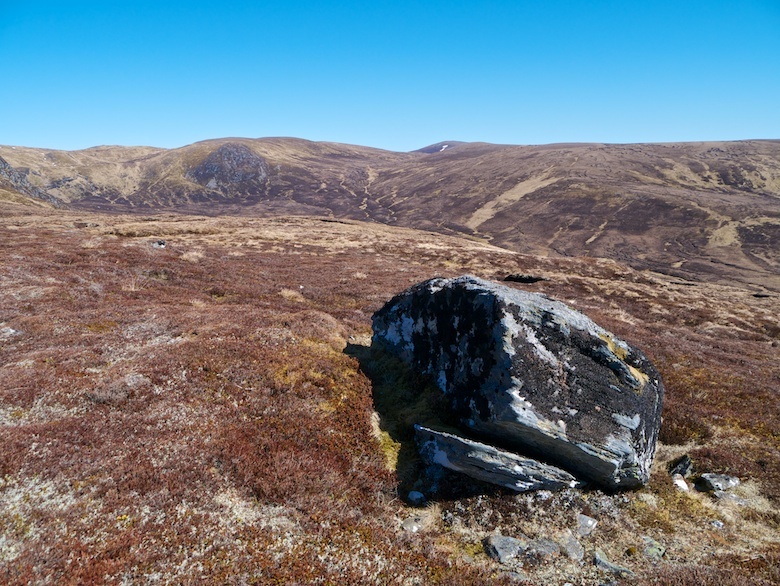 The wilds of the Monadhliath was what I had come for, endless waves of high hills rolling towards the horizon. 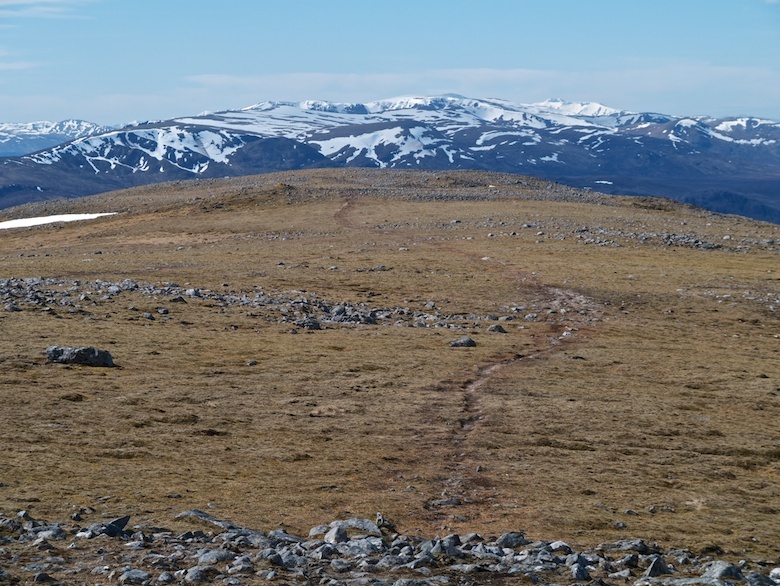 I could make out several groups of people either on or heading towards the summit of Carn Sgulain across the deep trench of Allt Cuil na Caillich. I had visited the summit many years ago and did not feel a need to do so again. 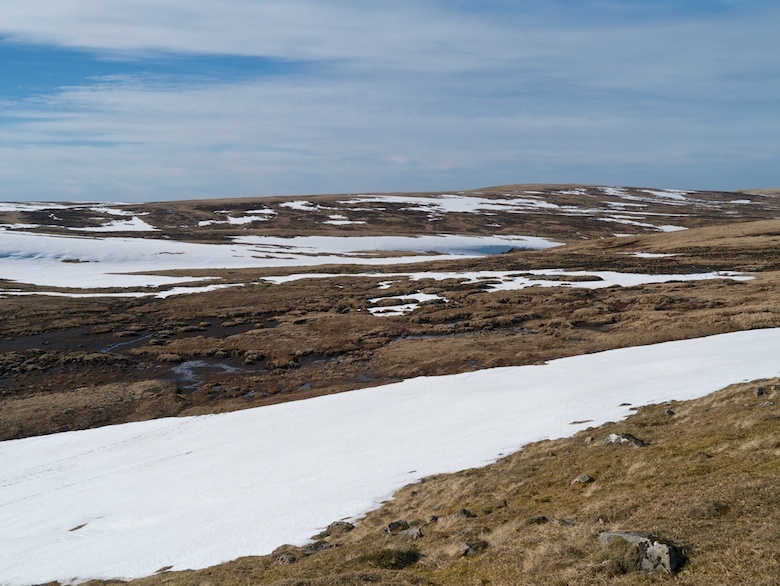 Therefore a feint path was followed to the north-west, a circuitous route being taken to avoid steep snow banks on either side of the stream. 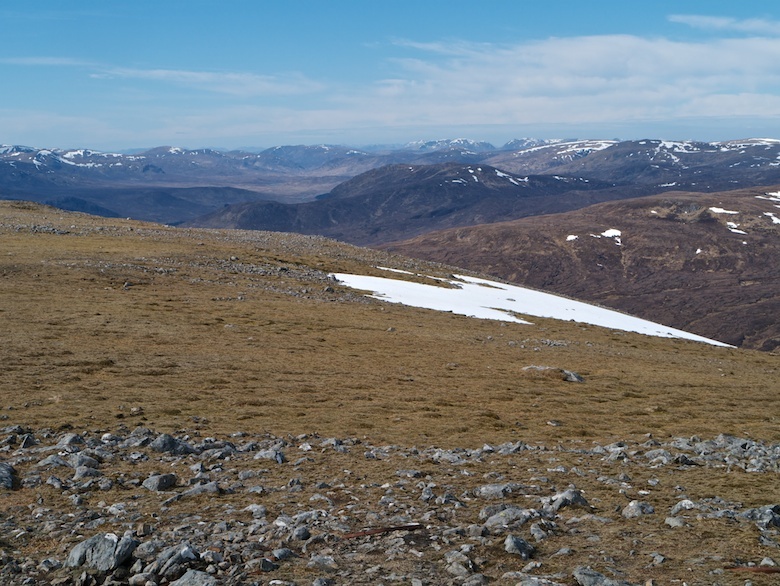 Instead of making a beeline direct to the summit ridge ahead I contoured around a shallow coire, reaching the line of fence posts just west of Meall a’ Bhothain. I regretted leaving my sunglasses in the car, especially when crossing the extensive snow patches. Even with a cap that sheltered my face, the snow was dazzling under the strong sun. Leaving a snow patch my vision would be like what you get when you walk into a dark room on a bright summers day. 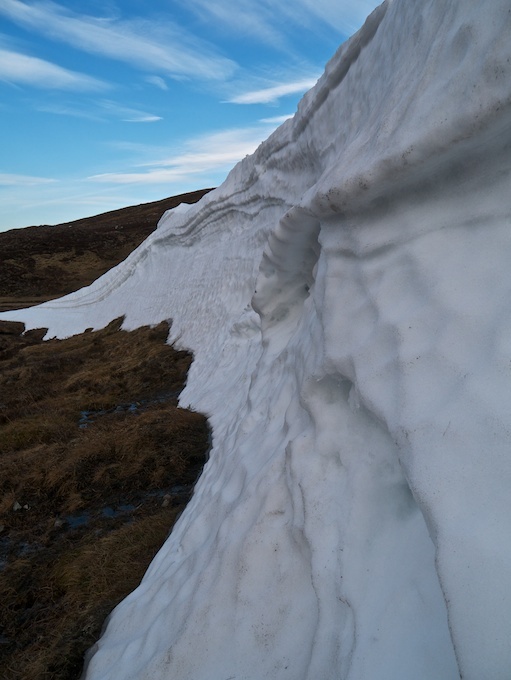 Carn Dearg had some fine cornices along its eastern facing cliffs. 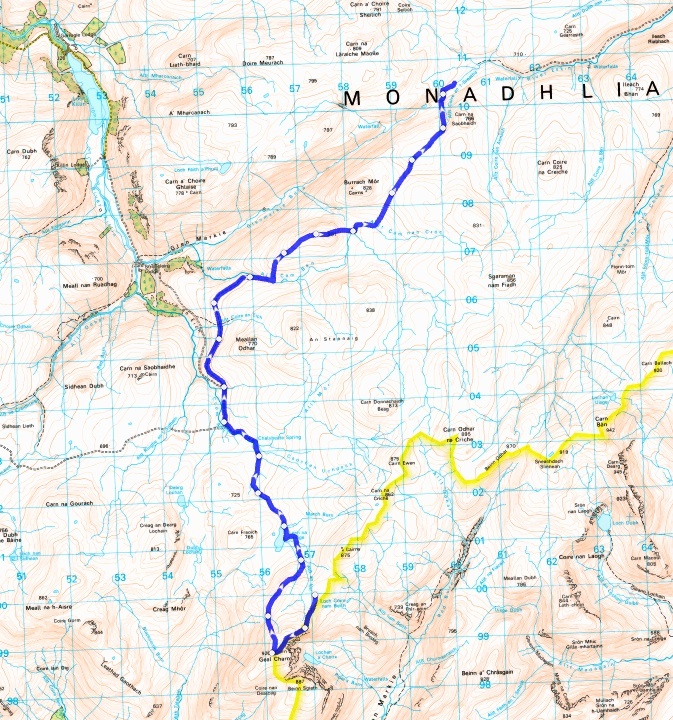 However it is another Monadhliath Munro that I had previously climbed so decided not to bother with the detour. 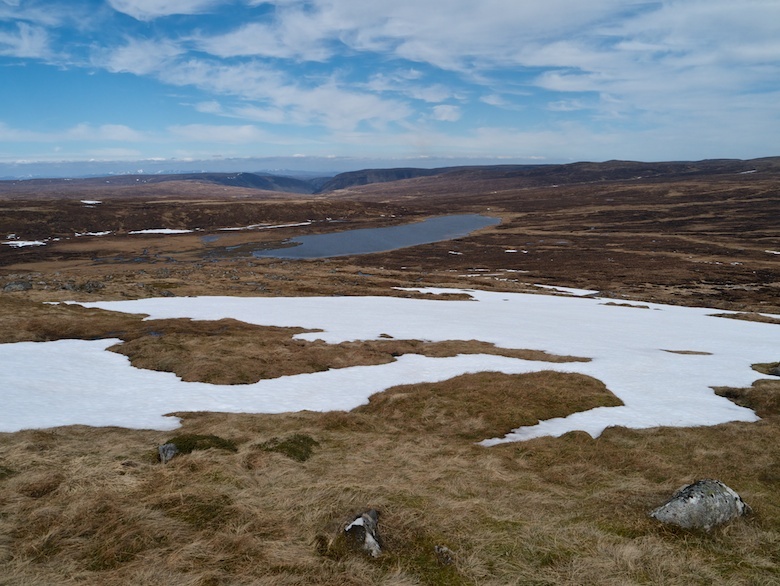 I was tempted to contour around the northern slopes of Carn Ban but that area was still covered in extensive snow, including the fringes of Lochan Uisage. Without sunglasses my eyes would be fried walking that way and the snow was becoming soft and arduous in the warm afternoon sun. It is not often that you get to stride out at such a height in the British hills and I relished every moment of the day. Often the going was easy across a mossy and stone covered tundra. This would be interspersed by bare areas of peat and networks of peat hags. 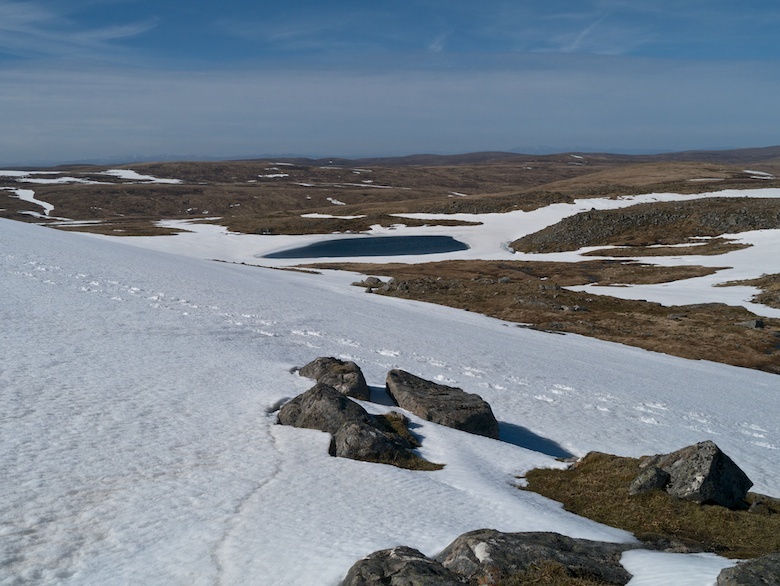 I decided not to climb Carn Odhar na Criche, instead dropping into the headwaters of Allt Odhar. 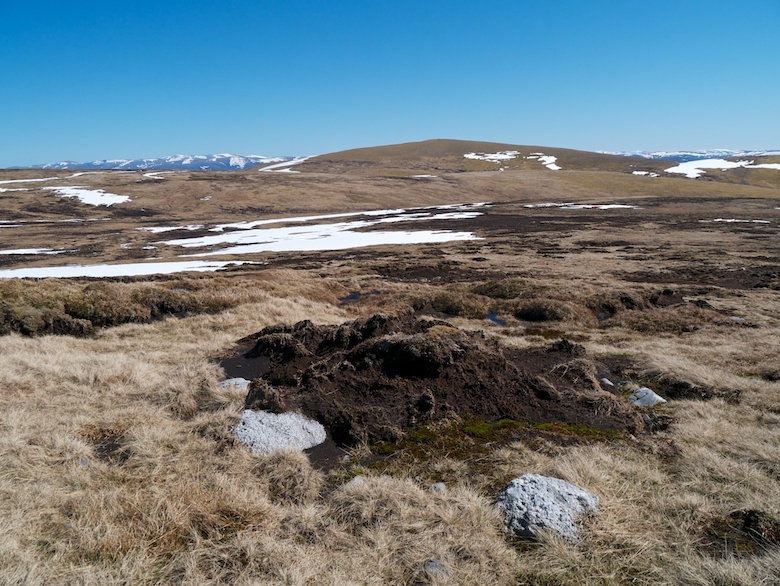 Here the peat was still wet and the snow deep, often giving way, hard work on tiring legs. 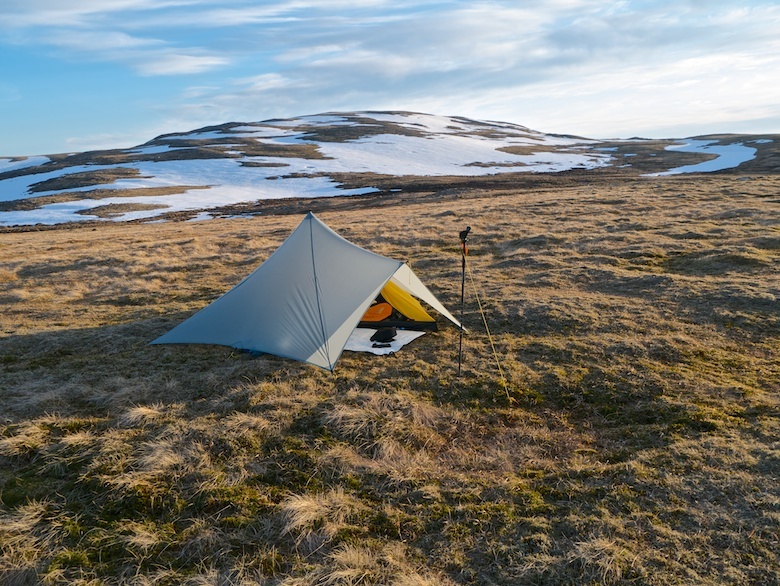 There was not much shelter on the plateau but the weather forecast for the night was good. I picked a spot that was covered in a luxurious carpet of moss on which to pitch. At 830 metres the temperatures quickly started to drop as the sun slipped towards the horizon. Unfortunately I had pitched in a such a spot that the setting sun was not visible. Feeling cold and tired I crawled straight into the Trailstar to get a hot drink and make dinner. It was below freezing long before I fell asleep. Some time today the blog ticked over the 400,000th page view. That lucky person can claim a free kiss from Reuben the Mountain Staffy if they wish. I must warn you that he uses his tongue. 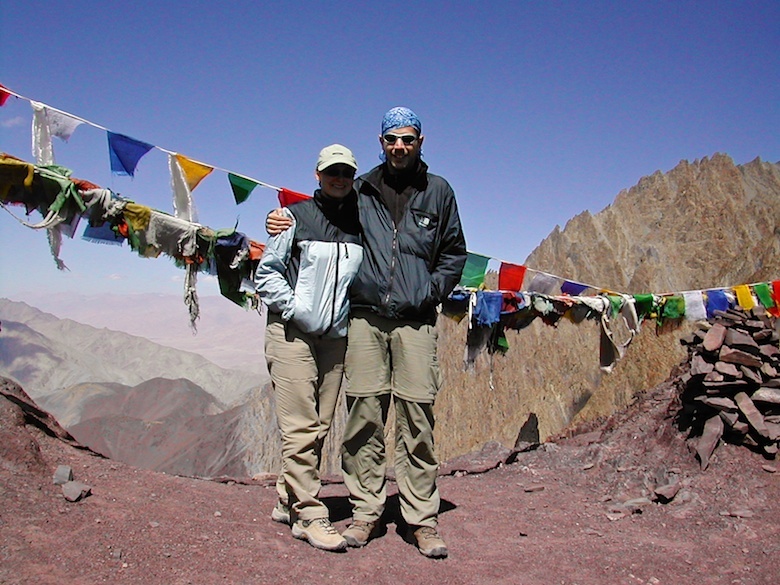 In celebration here is a 2004 photo of my now wife and I on the Summit of the Stok La pass in Ladakh (India). Getting up there is still my biggest achievement in terms of hiking. At 4,900 metres (16,076 feet) it is a hundred metres higher than Mont Blanc. Breathtaking in just about every way. A shame about the daft head attire and facial expression though! I had not taken into account the Friday afternoon traffic, therefore it was gone 4.00pm when I pulled into the car park at Crowden. As I was getting my kit together I have to say that I was a little perturbed by the pile of broken glass behind my car. A popular spot next to the busy A628 meant that it was not the most salubrious place to leave a vehicle overnight. The campsite was filling with weekend visitors as we passed by, a queue developing at the barrier by reception. We left the organised ranks of caravans and started the climb towards the disused quarry above Brockholes wood. 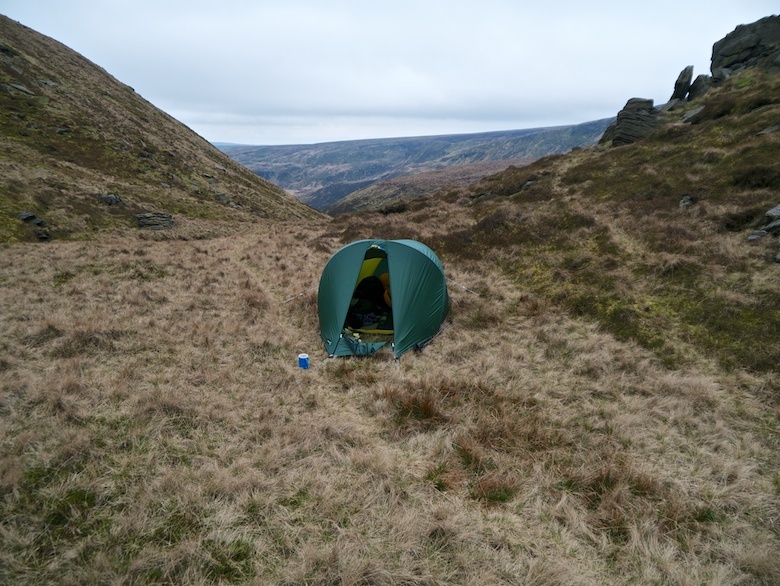 A guy returning back to the campsite said that he was envious that I was going to spend the night on the moor. With blue skies and light winds I was glad that I was. 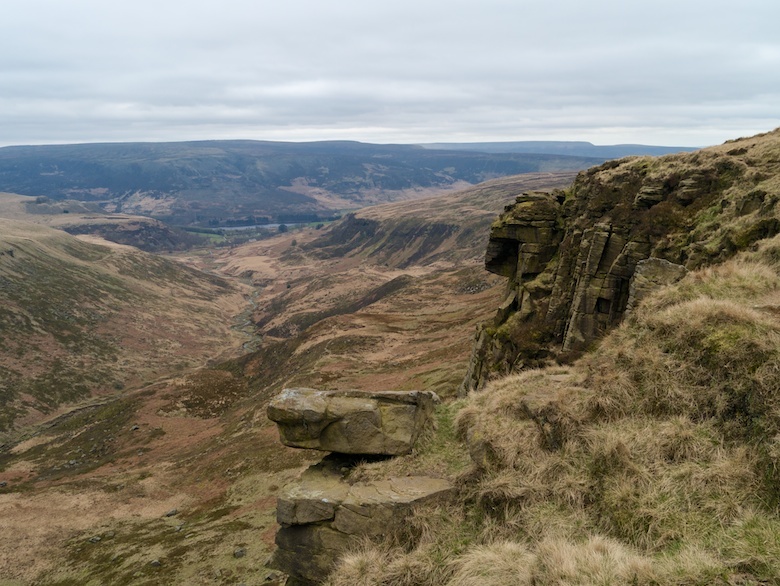 The last people I would see that day were passed as we started along the track that contours above Crowden Little Brook. This really is a delightful walk into surprisingly wild country, considering the main Sheffield to Manchester road is nearby. The path stays level for much of the length, providing an easy promenade into the the hidden depths of the valley. 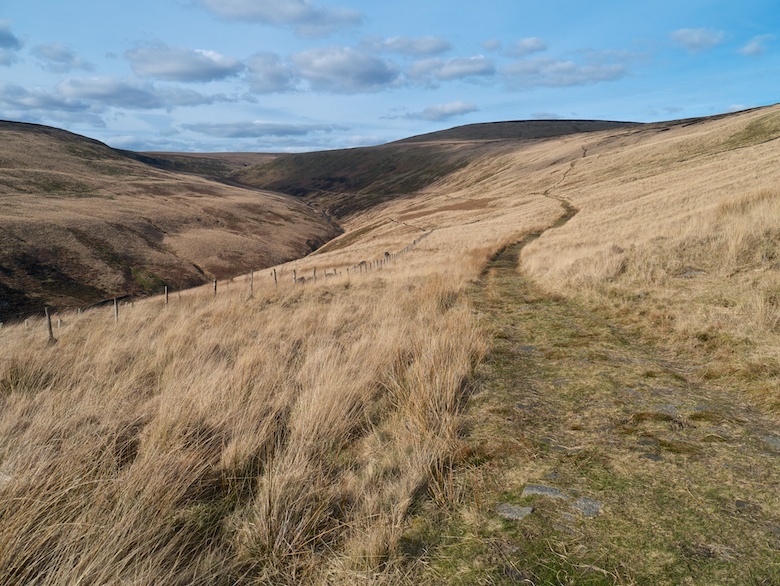 The path eventually turns into a sheep trod as it approaches Wiggin Clough. 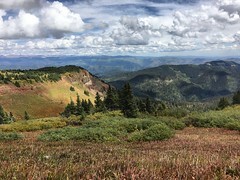 I had originally planned to continue up to the summit of Black Hill. However I really could not be arsed. We sat by the stream for a while for a snack (well I had a snack whilst Reuben watched intently). A change of plan then saw us climb steep slopes above the clough. It was a rough slosh across Siddens, the hillside being littered with an aircraft wreck. It was surprising just how far the debris was scattered. Overhead planes were making their descent to Manchester Airport, spoiling any feeling of remoteness. 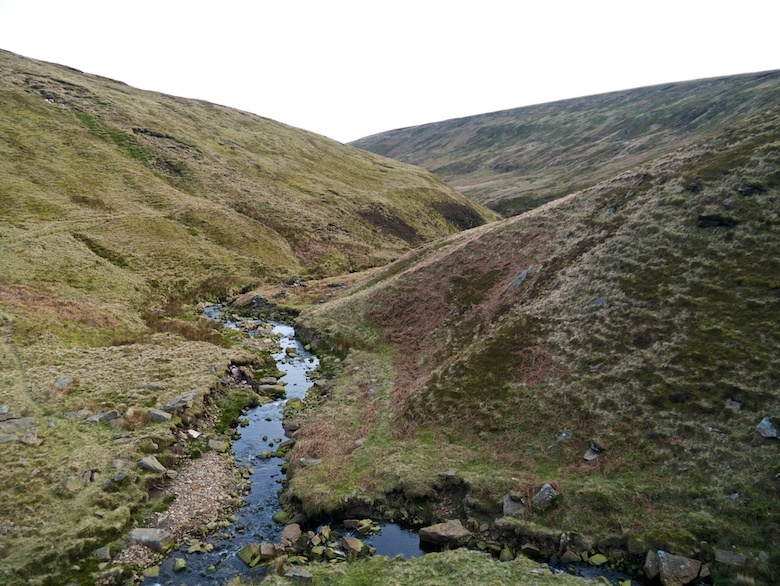 I had a spot in mind in which to pitch the tent, so we headed across trackless ground to the head of Crowden Great Brook. I located a great flat, tussock free spot to pitch on. It was about as hidden from prying eyes as its possible to be. I reckon that you could camp there for a week and not be spotted. I’m not saying where it is, get out a map and match the photos to the contours. A good way to boost map reading skills. I was very keen not to have to drop all the way down into the main valley to fill up my water bottles. I ended up finding a boggy hollow and skimmed reasonably clear water off the top. It was well worth carrying a water filter which soon made it palatable. Once again I had brought my large and heavy Voyager tent, a comfy palace for myself and Reuben. After darkness I climbed the nearby rocky outcrop and failed to get a good enough mobile signal to call my wife. However it was good to stand there in the darkness, the outlines of the surrounding hills just about visible. Back at the tent I only managed to read for half hour before falling asleep. I must have felt relaxed as I did not wake until 9.00am and it was 11.30am before I had packed up. A cold wind hinted at rain later that day. We climbed to the twin rocky outcrops to take in the fantastic view. I had been tempted to pitch up there but was glad that I had not as the wind would have been too brisk for a comfortable camp. 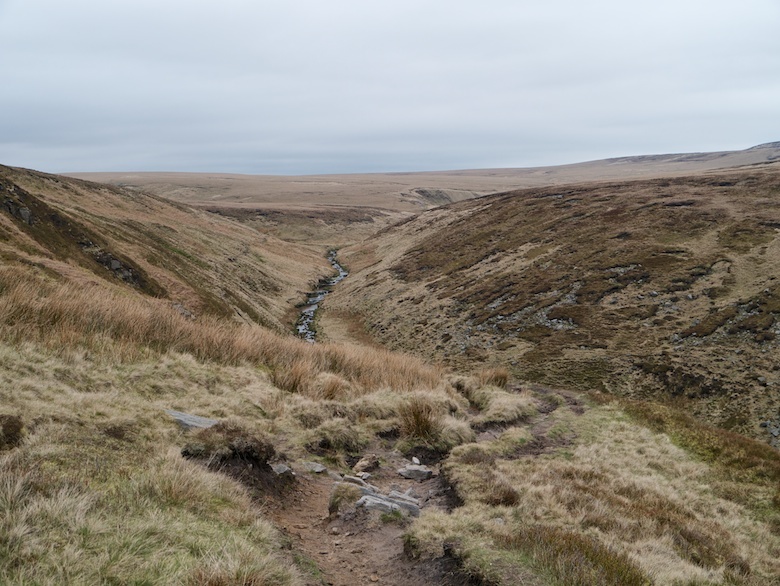 We headed up the valley for a short distance before crossing the stream and heading south on the Pennine Way. Here I met a nice couple and their terrier which had its own tiny panniers. Its barking and lunging turned out to be a way of attracting Reuben as she soon offered him her rear end. This offer passed unnoticed by my innocent dog. Above Laddow Rocks we headed west to the undefined summit of Black Chew Head, an easy bag to add to my list of Dewey hills. 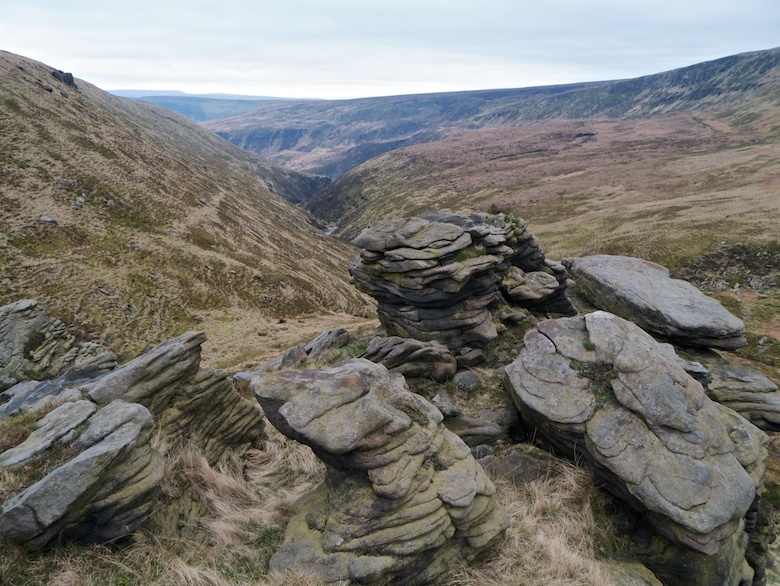 Laddow Rocks however are rather impressive, leading the eye towards the brooding hulk of Bleaklow. 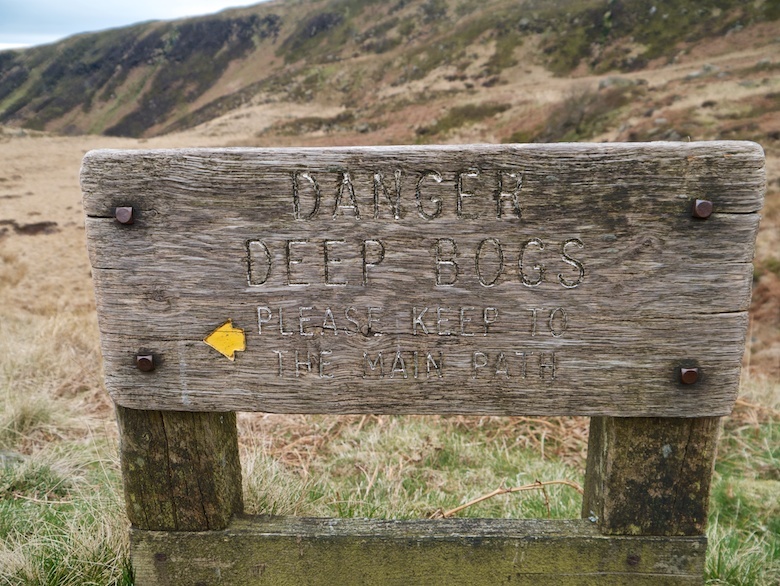 We simply followed the Pennine Way back to Crowden, passing this sign that almost tempted me to see if the nearby bogs were dangerous. I was relieved to find the car where I had left it with all its windows intact.